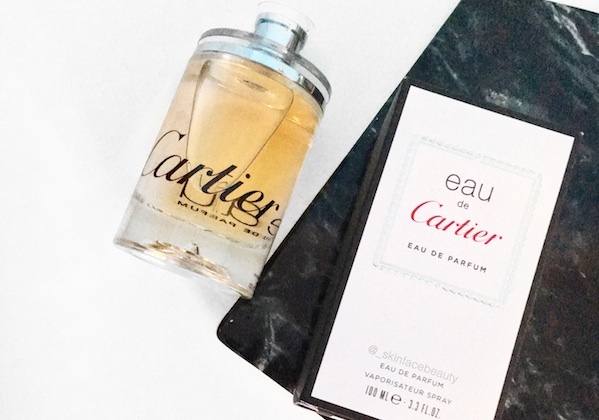 "A fresh scent revealing warm sensations, eau de Cartier created in 2001 draws its singularity from this olfactory paradox. Light yet sensual, it embraces the femininity of violets. More elegant than ever and ablaze with amber notes, this scent, with its precious balmy mellowness, smoulders with intensity. The Maison's in-house perfumer has further kindled the sensuality of this enhanced formula with the addition of a bewitchingly rare hint of warmth and vanilla." First and foremost, how stunning is the bottle? It makes my perfume stand look so beautiful. It scent isn't too overpowering, it's very pleasant and refreshing. I spray mine on top of moisturiser to encourage the longevity and it always works. It is a unisex scent meaning it can be worn by both men and women. It has a mix of citrus, vanilla and violet notes which is an amazing combination and can be worn all year round. Every time I wear it, I get endless compliments from customers at work. It has definitely become my signature scent!